The first time I knew that he said it was on June 1st, 2014. My son-in-law, Clay and my grandson, Indy were at Cedar Point when they were getting ready to go on a roller coaster. Since then my wife Pam and I have heard him say this a number of times. He has even directly asked me that. I was upstairs in the bedroo m, Brody and Indy were playing and wrestling around on the bed. I was there keeping a close eye on them to make sure they did not get too rough. Indy was being very careful to not fall down and he was unsure of his footing. 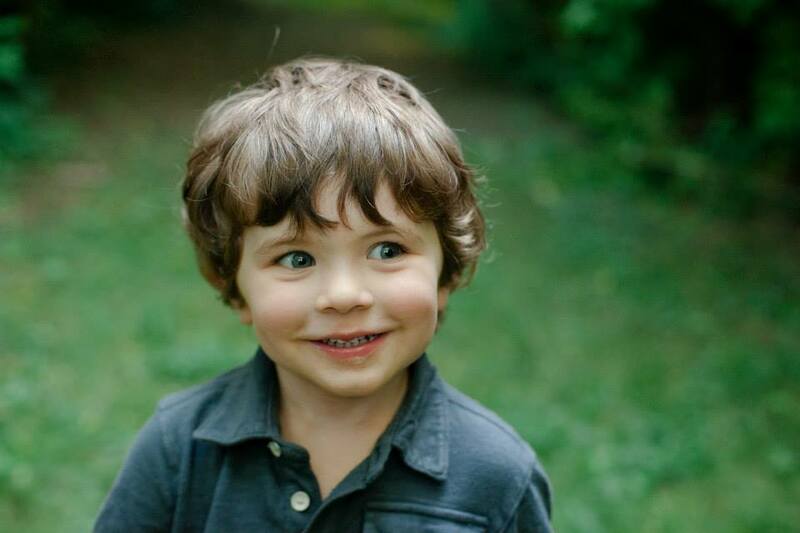 He looked up at me and asked, “You got me, Grandpa?” I said, “Sure Buddy… I got you.” He looked at me with a smile and with confidence in his eyes continued to play, knowing that his grandpa was watching over him. I smiled back at him and made sure that he was safe and that he was not going to hurt himself. I never really gave it another thought. It was just another cute comment that I have heard come from Indy since he could talk. Lessons from Little ones..……When Indy is nervous, afraid or unsure he will say to one of us, “You got me?”. Of course we always answer, “Yes Buddy we got you!” He doesn’t question how, analyze the process we choose to use or worry whether we heard him…… he just simply trusts us to take care of him and confidently moves on. We can do the same!! Whether we are sad, afraid, unsure, discouraged or whatever is heavy on our hearts, we can say to our Father…..”You got me?” His answer is ALWAYS, YES!! The truth of Vickie’s post hit me like a ton of bricks. I missed the truth that was found in the words of my grandson. Many times in our life, when things become difficult, we consume our life with worry. We allow the strife of this life to overtake us and all too soon we begin to doubt that there is anyone who really cares. Discouragement, hurt, resentment and regret cause us to lose sight of the fact that God, our Father, has all of this under control. He always keeps us in the protective shield of His love for us. So we can honestly ask God, “You got me?” and the answer is always YES!!!! I have heard people often say, “When I get to heaven I’m going to ask God…..” and what follows is their pressing question, their unanswered prayer, or their pain from when it seemed God wasn’t there. Often it has been, for them, a stumbling block in their walk with God. Why didn’t God answer my prayer? Why did He let my child die? Where was He when……? 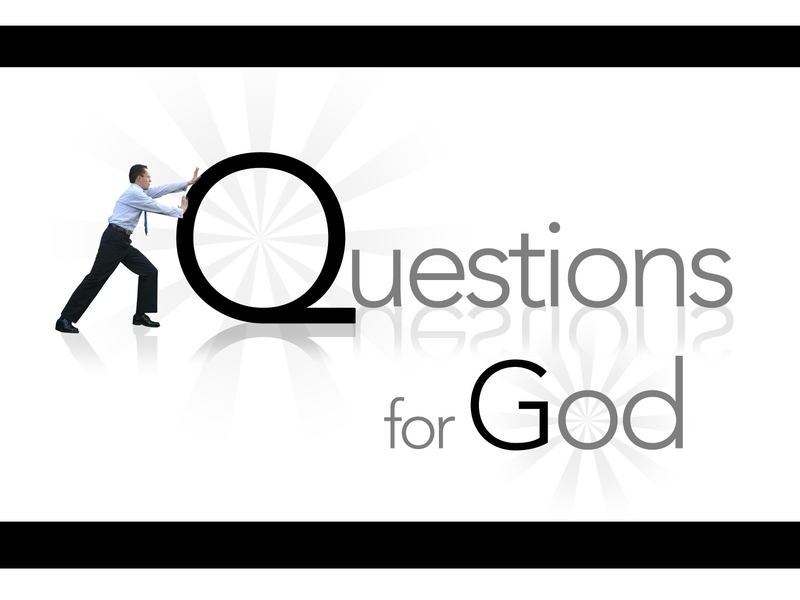 All of those unanswered questions can shake our faith or at least make us wonder about the plan and goodness of God. And yet, in the midst of the unanswered question, we know there is an answer, and it nags at us that God has left us with a question mark, an empty place, a doubt. Why didn’t He? How could God allow that to happen to me? My experience is that most often we blame God for something we actually caused! We go where we know we shouldn’t. We make bad choices. We basically ignore God until we are in trouble…then we blame Him for not protecting us from our own choices. So why didn’t God make people so they wouldn’t sin? If that were the case, we would be like robots with no will of our own. God did not make us that way. He gave us the ability to choose. So when we look at the tragedies in our world, in our own lives, and in the lives of those around us and ask why God allowed it, we find the answer by looking at a very similar question that was asked of Jesus. Apparently a tower had fallen on a group of Gentiles, and some were suggesting that it happened because it was God’s judgment. But Jesus said, “Were they the worst sinners in Jerusalem? No, and I tell you again that unless you repent, you will perish, too” (Luke 13:4–5). Death will knock at every single door. No one is exempt. It could happen to any of us. It could happen tonight or tomorrow. The statistics on death are quite impressive. One out of every one person will die. You can’t escape death. We all have an appointment with it. Job said, “O God, remember that my life is but a breath” (Job 7:7). And the Bible says, “It is appointed for men to die once, but after this the judgment” (Hebrews 9:27 NKJV). We don’t want to talk about death. We don’t want to discuss it. But we can’t avoid the inevitable. The answer is to turn to Jesus Christ. No one ever suffered like Jesus did. Though He was God, He also was fully man. And when those spikes went into His hands, He felt pain just like you and I would feel. Real blood coursed through His veins and spilled to the ground as He hung on the cross and died for the sins of the world. It was real rejection that He felt as His own, handpicked disciples turned away from Him for the most part. It was real loneliness that He experienced as He hung on the cross. The apostle Paul wrote, “For to me, living means living for Christ, and dying is even better. But if I live, I can do more fruitful work for Christ. So I really don’t know which is better. I’m torn between two desires: I long to go and be with Christ, which would be far better for me” (Philippians 1:21–23 NLT). I don’t think Paul was saying that he was looking forward to dying. Rather, he was saying that he knew what was on the other side. He knew what he had to look forward to. I think he also understood that in heaven, all of his questions would be answered. And if you are a believer in Jesus Christ, then all of your questions – all of your whys – will one day be answered, too. 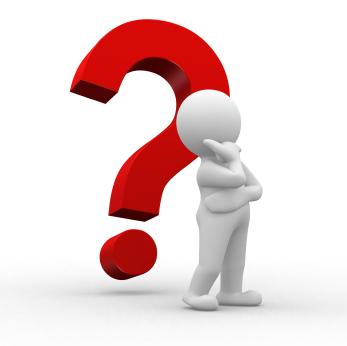 So here is the proposition for the day- if you could ask God just one question what would it be? The Bible gives me great hope because it’s clear that God is not done with me yet. I may not be the man that I wanted to be….but I’m not the potter….I’m the clay. He has in mind what He wants this piece of clay to look like. I have no idea what this work of art is to look like….I’m still being molded, but one day He will finish with a smile and declare that His work of art is finished. I find it humorus to think that I’m that work of art! But it’s true. I’m still on the potter’s wheel, still being molded, still finding lumps that the potter must work out so the fire will not crack me. I’m still being formed into the masterpiece the Master plans to make. What thrills me about the verse in Psalms is that God will not give up on this little piece of clay until His masterpiece is done! I might not look like much yet, but just wait….just wait till the potter is done. How exciting….not only am I a masterpiece, but I’m a masterpiece with a purpose! I still have things to do that only the little piece of clay, this masterpiece of the potter, can do. “The Lord will accomplish what concerns me.” In other words He won’t quit working in my life until He has finished His masterpiece and signed His work. I love that artists sign their work. They want the world to know who made it. They are proud of what they accomplished. And like the artists of the world, God says one day He will write His name on me….a finished masterpiece designed by the creator of the universe with works for me to do. I’m so encouraged that the great potter plans to make a masterpiece and won’t stop until I’m complete. I can’t wait to be that finished product….that masterpiece that glorifies Him….and I pray that He will be glorified in my life….even while I’m still a work in progress. That is true for all of us. We are a work in progress and the potter will not stop until His work of art is complete. God’s working in your life. Celebrate that today because one day we will see what God has done!!! I’ve lived for over 53 years…I thought I had seen it all. I remember clearly the images of the Vietnam war on the news each night. I remember practicing “emergency drills” in my early elementary years, where we would hide under our desks and put our head between our knees in case there was a tornado or some kind of threat. I remember that sick uneasy feeling in my stomach when I heard preacher’s say that the Communist’s were going to overtake America and that they would kill all Christians. I remember growing up in the “Cold War” when the threat of nuclear war seemed inevitable. Most of all… I remember 9/11 and the fear it instilled in me. Not fear for myself but of the fear for my children and grandchildren. I thought I saw it all but to be honest, I’ve never seen a time when fear is so dominant in our lives than it is today. This week I’ve watched as radical Muslims have killed hundreds in Iraq. I’ve watched as fear begins to rise in the cultures of the world….fear of man, fear of economic crisis, fear of disease. 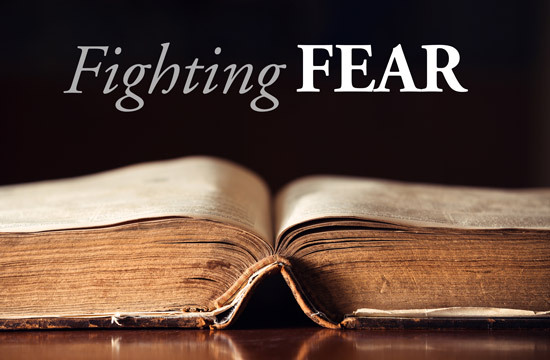 It seems as if most of our life we are fighting fear. Fear is in the very air we breathe. No one is immune to the temptation to fear. We are surrounded by the opportunities to fear. Companies downsizing, layoffs all around, economies is crisis, Ebola spreading…..shall I go on? Fears are abundant! As much as I want to say we are in unprecedented times… I really can’t. This is nothing new. King David lived in days when his very life was often on the line. He found himself, more than once, running for his life. Fear was part of his reality too, but he made choices to deal with the fears. This Psalm is one of them. In verse 3 he writ es, “but when I am afraid, I will put my trust in you.” David never said he didn’t fear or that fear wasn’t real for him. He gave us his choice when fears arrive. 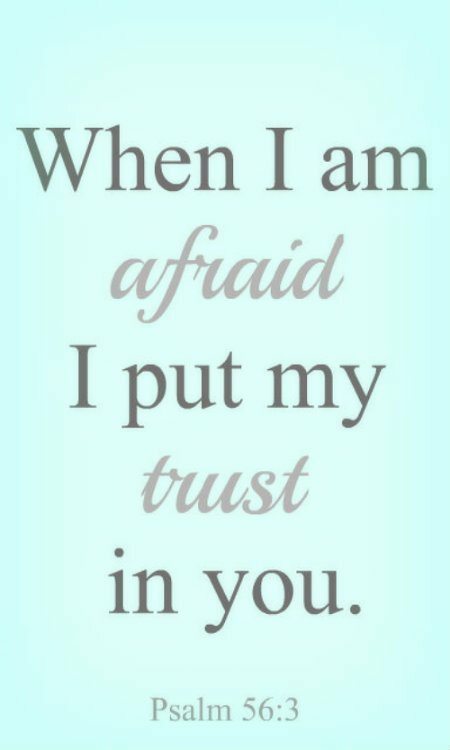 When I am afraid I will put my trust in you. What a profound and rich statement of faith. When all I see around me is an opportunity to fear I will choose to trust the God who loves me. So what is your choice when fear comes, because it will. Do you fret, get anxious, drink too much, pace the floor, take a sedative, panic! What do you do? It’s a choice you know. Fear will come, what will you do when it arrives?